WOW! Women On Writing Blog: Interview with Sarah Mian, First Place Winner of the Summer 2008 Flash Fiction Contest! 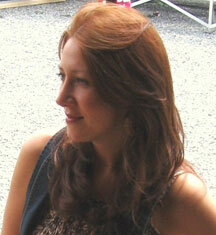 Interview with Sarah Mian, First Place Winner of the Summer 2008 Flash Fiction Contest! Sarah Mian has been a writing junkie since childhood. To support her habit she has worked, among other jobs, as a film extra, waitress, substitute teacher, and currently as an exhibit custodian who ships and receives evidence in a crime lab. She has been published in numerous journals and anthologies, including The Vagrant Revue of New Fiction and The New Quarterly. Her co-written play, 'Creatures of the Moment' was produced by Metamorphic Theatre. Sarah has written her way across Canada, living on Vancouver Island in the west, Toronto in the middle and Newfoundland in the east. She also spent nine months abroad to see how the other half lives before returning home to Nova Scotia where the waves break on all sides and everyone says 'thank you'. She lives with her boyfriend, Leo, who can't sing but is a damn fine kisser. You can read Sarah's winning contest entry, "English as a Second Language," then come back to our interview with her below. WOW: Congratulations on winning first place in WOW! 's Summer 2008 writing contest! How do you feel? Sarah: It's elating to have my work read and considered, let alone recognized as exceptional. I'm grateful I saw the contest listing and took a chance. In November, I kept checking the web site to see who had won and all of a sudden my own face appeared on the screen! WOW: That must have been fun to see yourself there as the winner! Could you tell us a little about your story and what encouraged the idea behind "English as a Second Language?" Sarah: Now that I am back home and stationary, I'm doing a lot of exotic travel in my head, sucking on all the juices of my past adventures or those of people I know who lived in foreign countries. I imagined this piece as a visual post card, a haiku, a love letter and a very long story all in one. WOW: Your story is artistic and poetic, and does seem to have all of those elements. Have you written other flash fiction? What type of writing do you most prefer? Sarah: Short fiction has become my medium of choice in recent years, but I am always experimenting with length and form. Writing poetry and flash fiction disciplines me to cut away the fat, which carries over into longer works. I'm learning how to paint whole scenes with just a few brush strokes and how to leave some edges in shadow. I believe this is the secret to great writing; when the story is mutable enough to allow recreation with each reader. It's like magic. WOW: I love the image of painting whole scenes with just a few brush strokes. Aspiring authors would probably love to know more about your writing routines. For example, where do you write? How many hours (or words) a day do you write? Sarah: I have to write. It's not about squeezing it in; it's as much a necessity as brushing my teeth. If I don't write for a week, I feel completely out of sync. Therefore, I have chosen a career that does not rob me of my creative energy. During my breaks at work I brainstorm on whatever I'm working on in my "real" job as a writer. The amount of time I spend writing a day depends on what demands to be freed from my mind; sometimes I unleash fifteen pages at my desk after work, sometimes just two sentences. I tend to back and forth between wholeheartedly living life and rehashing/analyzing it on paper. WOW: You're obviously a very dedicated writer. Have you ever faced writer's block or burnout? If so, how do you deal with it? Sarah: If anything, my problem is that I have too many ideas and have a hard time honing and ordering (or ditching!) them. The ability to recognize what isn't working is a crucial writing skill. On the first draft I let it all out, then the hard work really begins. WOW: We can relate to that! What other projects are you working on? Anything we should look out for this year? Sarah: I am perpetually sending out short stories to literary journals and I've recently completed a comedy screenplay. In the next three years, I expect to start a novel. WOW: We wish you luck with all of those endeavors. Do you have any final words of wisdom for our women readers/writers? #1-When you think a piece is finally finished, put it away for at least a month. Guaranteed, when you read it back you'll see room for improvement. It's tricky to get things out of our head and make them lie down on paper in a way that others can make sense of them. You need distance in order to recognize if you've achieved clarity with every line. #2 -Ignore the rule that you can't submit a piece to more than one publisher at once. Having one editor agree to publish your work is like capturing a unicorn; what are the odds of capturing two? I say, send your work everywhere and anywhere, and if a piece you really believe in has been rejected more than once, keep trying. 'English as a Second Language' was rejected three times in slightly different drafts before winning this contest. WOW: Great advice, Sarah. Congratulations again on your first place win! Every Tuesday we're featuring an interview with a top 10 winner from the Summer 2008 Flash Fiction contest. Be sure to check back and see who's next! There's still time to enter our current writing contest, too! The deadline for entries is February 28, 2009.